SAN DIEGO–D&K Engineering recently partnered with Chilldyne to design, build, and commercialize Chilldyne's Cool–Flo® liquid cooling system, a $1.25 million direct–to–chip liquid cooling system for high efficiency data centers. Now that Chilldyne has successfully installed the system in a South Korean national lab, D&K facility. Chilldyne's technologies were designed specifically to eliminate the risks associated with liquid cooling while keeping deployment costs low and reducing data center operating costs. D&K designed the Chilldyne Cool–Flo® system in partnership with Chilldyne engineers. "We are pleased that our patented liquid cooling system was included in this $1.25 million customer installation," said Chilldyne's Engineering has reported that it will begin building and shipping Cool–Flo systems in quantity at its ISO–certified President and CEO Robert Spears in a press release. 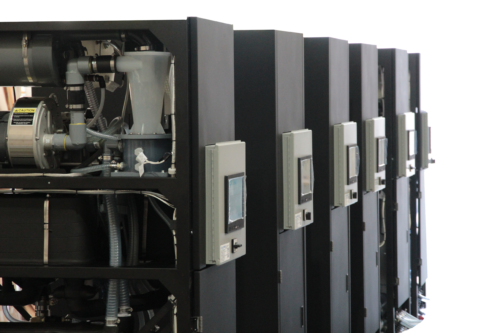 "This is the second large–scale order we have sold to our Korean reseller partner, Mirhenge, following a similar system installed in 2015." The Chilldyne Cool–Flo system provides water under negative pressure to cool 660kW of power. Each server blade is equipped with a Radeon R9 Fury X GPU card, injection molded GPU manifolds, and custom Chilldyne cold plates with internal turbulators. The Cool–Flo system uses six Cooling Distribution Units (CDUs) in a 4+2 redundant back–up configuration to deliver water to the 25 racks and 300 Cirrascale servers. "The Chilldyne partnership is a perfect example of D&K Engineering's flexible model of engagement allowing a seamless transition from Chilldyne's design team to D&K's manufacturing to successfully build Cool–Flo systems," said Scott Dennis, CEO of D&K Engineering. D&K Engineering (www.dkengineering.com), headquartered in San Diego, offers design, new product introduction (NPI), and contract manufacturing services. Specializing in products and instruments with high innovative content and complex manufacturing lifecycles, the company aims to provide clients with "comprehensive and coordinated commercialization services for complex hardware–based systems, all under one roof."